The Coppell football team holds up the area trophy following the Cowboys' 29-25 victory over Rockwall. 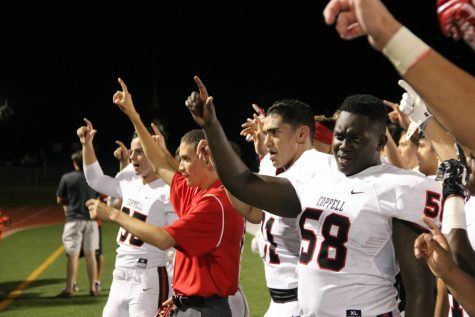 It was Coppell's deepest playoff run in six years. 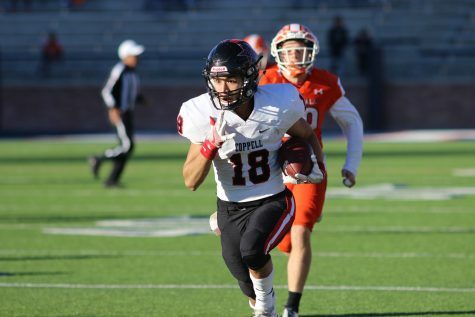 Coming off the heels of three consecutive first-round playoff exits, a new regional alignment and the loss of key prolific players on both offense and defense, Coppell football’s 2016 team had a lot of questions to answer as fall approached. But as each week passed, and the wins continued to pile up, several things became clear. 1. A revolving door of defensive lineman works. 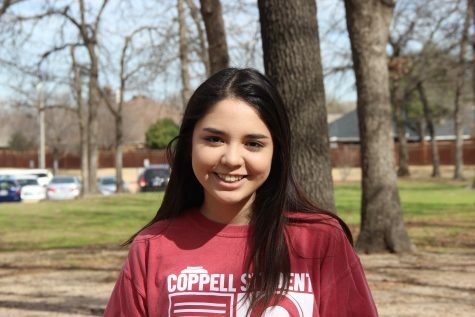 Early in the season, gaping holes could be seen in the interior line of Coppell’s defense late in games. In the worst loss of the year, a 41-10 train wreck at Jesuit, Coppell coach Mike DeWitt simply said “we were just tired”. Senior defensive lineman Isaac Colter (58) and junior defensive lineman KK Moe (91) show school pride following one of Coppell’s 10 wins this season. Colter and Moe were two of the centerpieces of the defensive line rotation that became very successful as the season went on. From that point onward, a point was made to rotate seniors Jiwan Seo and Isaac Colter along with junior Cleon Jackson and sophomore JR Barker on the defensive front. 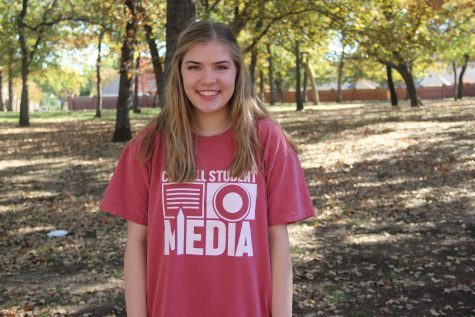 Following the Jesuit game in which they allowed 188 yards on the ground, Coppell’s run defense drastically improved, allowing only 100 rushing yards per game for the rest of the regular season. 2. Coppell can develop receivers like nobody’s business. Coming into this year, the entire receiving corps combined had exactly as many varsity snaps as I did: zero. But as the year went on, several athletes grew into their roles as well as anyone this year. 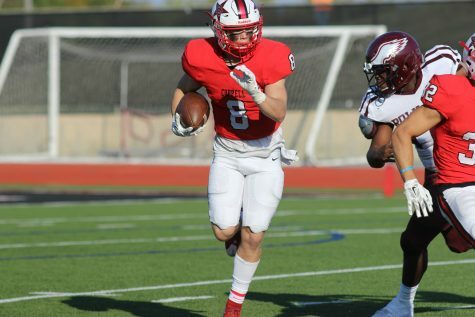 Sophomore Blake Jackson emerged as junior quarterback Brady McBride’s favorite target after his huge night in Coppell’s comeback win over McKinney Boyd. Sophomore wide receiver Blake Jackson carries the ball in Coppell’s first round playoff victory over Rowlett. In his first season on varsity, Jackson was pivotal to the success of the receiving corps. 3. Matt Dorrity is fast. Really, really fast. After not putting up huge numbers early on in the season even as the team’s only starting senior wideout, Dorrity became a big play just waiting to happen in the second half of the year. Senior wide reciever Matt Dorrity runs down the sideline for the game winning score in the area round of playoffs against Round Rock. Dorrity came on strong in the playoffs, emerging as a big-play threat on almost every possession. His great hands and blazing speed gave him the ability to stretch the defense, and when in a footrace with a safety, he would almost always beat him to the end zone. 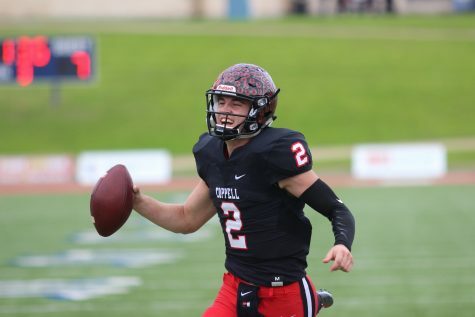 On the game-winning touchdown in Coppell’s 28-24 playoff victory over Rockwall, Dorrity’s flying 40 time with pads, a helmet and the ball in his hands was 4.24 (!!) and even though the safety was in position to make the tackle, Dorrity simply beat him to the edge. While he has played his final game in a Coppell football uniform, this bodes nicely for track season. 4. Brady McBride is a straight up playmaker. Remember the game-winning play I just mentioned? Yeah, that was in large part due to McBride’s ability to somehow pick up the ball off the ground and get it downfield. While his legs have always been a weapon, his pocket passing has developed more this year as well. Junior quarterback Brady McBride smiles as he heads into the end zone in Coppell’s 49-44 loss to Round Rock in the regional semifinals. McBride showed tremendous growth in his second season as the starting quarterback, providing decision-making along with ability to extend the play. His ability to throw on the run, rolling both left and right, has become a nightmare for District 9-6A defenses. McBride’s decision making also improved this year, as did his completion percentage, which improved from 55 percent to right up around 60. But more than that, McBride can just make plays at the most opportune times. 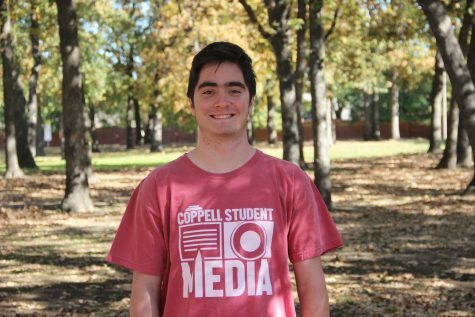 He led go-ahead drives in all four of Coppell’s close victories this year. And for some reason, he seems to love bad snaps, turning two of them into pivotal plays in both of the Cowboys’ playoff wins. 5.This defense will miss their seniors. 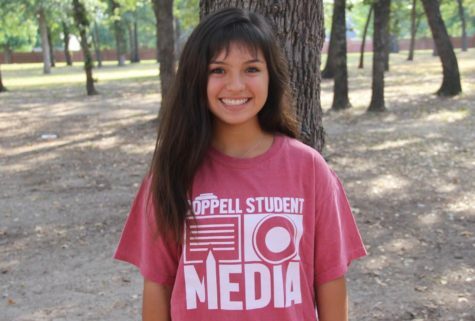 At the start of the season, the defense looked to be one of Coppell’s strong suits. With the core of the defense returning, the squad was expected to shut down their lesser District 9-6A opponents. Led by senior linebackers Eric Loop, Ryan Finglass, Holden Rupely, Tristan Kalina and Ryan Jones, alongside senior defensive backs Austin Weathers, Skylar Seidman, Ben Goyne and Spencer Haddock, with several others on the defensive line, the side was able to hold its district foes to 17 points per game. This includes the outlier of the Jesuit game in which it was thrashed for 41 points. 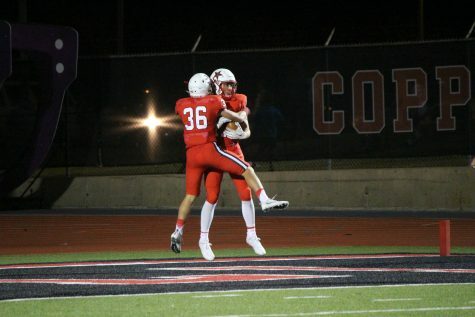 Senior defensive backs Skyler Seidman and Ben Goyne celebrate after Goyne’s pick-six in one of Coppell’s early-season home district victories. Seidman, Goyne and the other defensive seniors will be missed by the Coppell defense in the following year. These seniors will leave gaping holes at many positions. However, these are holes that can be filled. Sophomores Jonathan McGill and TJ McDaniel will hold down the fort in the secondary, while junior Thomas Edwards will lead the charge at linebacker, and sophomore JR Barker, who is a physical specimen at the defensive line position, will provide much needed support in the middle. And, as they are always able to do, the Cowboys will replace the other spots with young guys who will make the jump from either the backup spot or junior varsity. 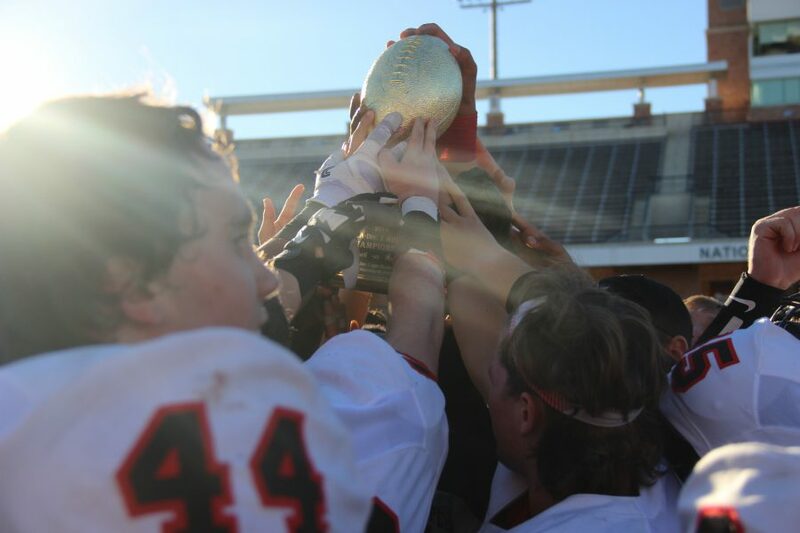 While it may not be as dominant as they were this year with a stellar group of seniors, the Coppell defense will do just fine.